The migration of immersive media towards telecommunication applications is advancing rapidly. Impressive progress in the field of media compression, media representation, and the larger and ever increasing bandwidth available to the customer, will foster the introduction of these services in the future. One of the key components for the envisioned applications is the development from two-dimensional towards three-dimensional audio-visual communications. 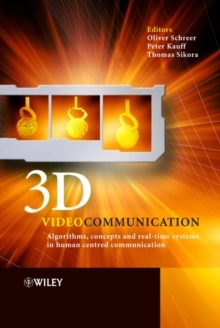 With contributions from key experts in the field, "3D Videocommunication": provides a complete overview of existing systems and technologies in 3D video communications and provides guidance on future trends and research; considers all aspects of the 3D videocommunication processing chain including video coding, signal processing and computer graphics; focuses on the current state-of-the-art and highlights the directions in which the technology is likely to move; discusses in detail the relevance of 3D videocommunication for telepresence systems and immersive media; and, provides an exhaustive bibliography for further reading. Researchers and students interested in the field of 3D audio-visual communications will find "3D Videocommunication" a valuable resource, covering a broad overview of the current state-of-the-art. Practical engineers from industry will also find it a useful tool in envisioning and building innovative applications.